Concerned by your privacy protection, Teo & Co SARL company, under the name of TEO JASMIN, is committed to ensuring the highest level of protection of your personal data. 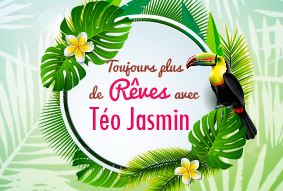 As part of its activities, Teo & Co makes available to its private customers an e-commerce service accessible from the website www.teojasmin.fr and from the site b2b.teojasmin.fr for business customers. To deliver its service, Teo & Co collects personal data about individuals. Data collection is done on the Teo & Co websites, by phone, or when receiving paper orders. This section is intended to provide you with complete information on the use made by Teo & Co of the personal data of its customers. Teo & Co, in charge of this treatment, undertakes to comply with the provisions of Regulation (EU) No 2016/679 of 27 April 2016 on the protection of personal data. In the personal data collection forms, available on the site or in paper format, the Client is notably informed of the mandatory nature or not of the collection of data. In the event of failure to provide a mandatory data field, Teo & Co will not be able to perform its services. 1. WHO COLLECTS PERSONAL DATA ? 2. WHAT ARE THE PURPOSES OF COLLECTING YOUR PERSONAL DATA AND WHAT ARE OUR REASONS ? - When the user has given his consent. - A "legitimate interest" of Teo & Co must not violate the rights and freedoms of users. Examples of legitimate interests mentioned in the GDPR include fraud prevention, direct marketing and data sharing within a group of companies (such as Teo & Co). Why we use your personal data? What are our reasons? - Anti-fraud operations and fraud risk assessment have been authorized by the CNIL as explained in point 8.3. 3. WHO IS YOUR DATA TRANSMITTED TO ? Your data is transmitted to Teo & Co partners who can process the data on their behalf (these are recipients) or only for the account and according to the instructions of Teo & Co (they are subcontractors). - The implementation of technical maintenance and development of the website, internal applications and information system Teo & Co.
- In case of sale, transfer or the merger of the business or a part of it, or if Teo & Co acquires or merges with another company. - If such a transaction takes place, Teo & Co will ensure that the other party complies with data protection legislation. 4.1. What are my rights ? 4.2. HOW TO EXERCISE THEM? - By post, by writing to us at the following address: TEO & CO sarl - Customer Relations - ZI Actiloire rue flowers fields - 45190 Beaugency By indicating your name, address, email and if possible customer reference to accelerate the consideration of your request. The application must be accompanied by a proof of identity. Teo & Co will reply within one month after exercising the right. In some cases, due to the complexity of the request or the number of requests, this time can be extended by 2 months. 4.3. WHAT ARE THE CONSEQUENCES OF EXERCISING THE RIGHT OF OPPOSITION TO PROFILING ? In the event of the exercise of a right of opposition to profiling marketing, the user is informed that he will continue to receive commercial solicitations but these will be less relevant and will no longer be targeted according to his interests of the person. 4.4. WHAT TO DO NEXT? 5. WHAT IS THE SORT OF MY DATA AFTER MY DEATH ? The User may provide guidelines for the retention, erasure and communication of his personal data after his death in accordance with Article 40-1 of Law 78-17 of 6 January 1978. These directives can be general or particular. The User can formulate his advance directives by email to support@teojasmin.com. 6. ARE MY DATA SENT OUT OF THE EU ? You are hereby informed that personal data concerning you may be transmitted for the purposes set out above to companies located in countries outside the European Union and which do not have an adequate level of protection with regard to privacy. Protection of personal data. Prior to the transfer outside the European Union, and in accordance with the regulations in force, Teo & Co implements all the procedures required to obtain the guarantees necessary to secure such transfers. - Computer maintenance of the site and developments: in Vietnam - governed by a confidentiality agreement between Teo & Co and the provider (governed by French law) prohibiting the escape or use of any data. For more information on managing cross-border flows, you can contact the Data Protection Officer. 7. HOW LONG WILL MY DATA BE PRESERVED ? Teo & Co has established specific rules regarding the retention period of the Users' personal data. - the people said "Customers" who have made at least 1 purchase. A separate retention period will be applied to prospects and customers. Regarding prospects, the starting point of the retention period is the creation of the account. Regarding the customers, the starting point of the shelf life is the last purchase of this one at Teo & Co.
- Records of conversations with customer service on the online chat are kept for a period of 1 year. - Invoices related to purchases are kept for 10 years. For more information on the retention periods applied by Teo & Co, you can contact customer service by email at support@teojasmin.com. 8. WHAT SECURITY MEASURES ARE TAKEN TO PROTECT MY DATA ? As a controller, Teo & Co takes all the necessary precautions to preserve the security and confidentiality of the data, and in particular to prevent them from being distorted, damaged or unauthorized third parties having access to them. Teo & Co has developed a strong security system to ensure the highest security of the data collected and to detect data breaches. This includes the physical security of the buildings storing our systems, the security of the computer system to prevent external access to your data, and having secure copies of your data. When using subcontractors, Teo & Co ensures that they comply with the data protection rules. To ensure payment security, Teo & Co uses the services and module of the provider Credit Agricole, under SSL certificate. This standard is an international security standard whose objectives are to ensure the confidentiality and integrity of cardholder data, and thus secure the protection of card data and transactions. When you place an order in payment card bank Teo & Co, our order taking system connects in real time with the e-transaction system of the Crédit Agricole which collects your data and carries out various checks to avoid abuse and fraud . The data are stored on the servers of Crédit Agricole and are never transmitted on the servers of Teo & Co. at any time. The module of Crédit Agricole makes the request for authorization from the bank and sends us a transaction number which allows transactions up to the amount of the authorization. Teo & Co has made the choice to store no data about your credit cards on its site. 9. WHAT TO KNOW ABOUT DATA COLLECTED BY SOCIAL NETWORKS ? Teo & Co proposes to use social networks to improve the commercial relationship and offer you targeted advertising offers on these networks. The use of social networks to interact with Teo & Co (including Facebook Messenger tools, Facebook Connect, Facebook, Instagram or Twitter "share" buttons) is likely to lead to data exchanges between Teo & Co and these social networks. Teo & Co invites you to consult the personal data management policies of the various social networks to know the personal data that can be transmitted by them. 10. WILL I RECEIVE COMMERCIAL SOLICITATION? Teo & Co uses your contact information to send you targeted advertising, particularly by email and on social networks. In this context, Teo & Co undertakes to respect the rules applicable to each prospecting channel. Teo & Co complies with the rules laid down in Directive 2002/58 / EC of July 12, 2002, which provides for the express preliminary collection of the User's consent for the sending of commercial prospecting by electronic means. Thus, when creating your account on the site, you expressly requested your consent to receive offers of Teo & Co by email. Teo & Co will not send you personalized requests by email or SMS if you have not consented. In any case, the User has the possibility to oppose the receipt of these requests by clicking on the unsubscribe link provided in each email or by visiting his Teo & Co account in the newsletter section or by contacting the customer service by email at support@teojasmin.com. When using our Service, information relating to the navigation of your terminal (computer, tablet, smartphone, etc. ), is likely to be saved in "Cookies" files stored on your device, subject to the choices you have expressed about Cookies and that you can change at any time. 11.1. WHAT IS A COOKIE ? 11.2. WHAT ARE THE REASONS FOR COOKIES, TAGS AND TRACERS ? - Establish statistics and volumes of use and use of the various elements that make up our services thanks to audience measurement cookies. - Share information with advertisers on other websites to provide you with advertising relevant and in line with your interests through advertising cookies. - Share information on social networks through cookies to share on these networks. 11.3. HOW TO SET THE COOKIES, TAGS AND TRACERS DEPOSIT ? In accordance with Directive 2002/58 / EC of July 12, 2002, Teo & Co collects your prior consent to the deposit of advertising cookies, audience measurement and sharing to social networks. You can configure your browser so that cookies are saved in your device or, conversely, they are rejected, either systematically or according to their issuer. You can also configure your browser so that the acceptance or rejection of cookies is offered to you punctually, before a cookie is likely to be registered in your device. CommeHow to exercise your choices, depending on the browser you use? 12.3. 2. Setting up the operating system your smartphone You have the option to control the deposit of cookies on your smartphone in the rules of the operating system. In order to comply with the regulations, Teo & Co uses a tool allowing the user to set the deposit of cookies when connecting to the site www.teojasmin.fr This tool will be available in a few days and will allow you to access the list of cookies deposited and configure the deposit Our cookies do not track your navigation. We do not store any information related to your connection.